Slow-cooked chicken, bright sweet potatoes, and jalapeños get a kiss of Near East spices. 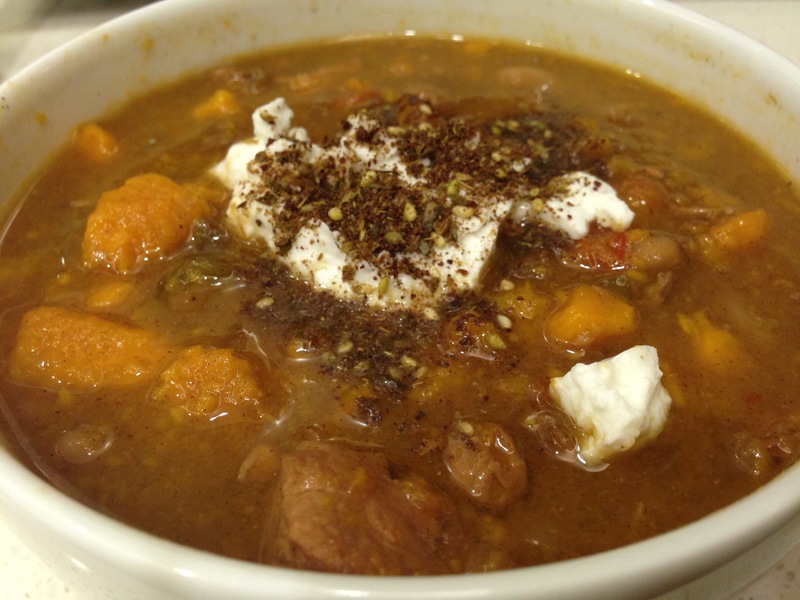 Moroccan tagine meets American chili. Whether you are thawing out from a snow-in, rain-in, or simply are looking for a great winter (or Super Bowl) recipe, this unorthodox chili is a great alternative to a standard chili con carne or white chili. It can be made vegetarian friendly, too! It started with a rainy weekend and a need for culinary inspiration. I opened an old cookbook for some recipe roulette, in search of soups. 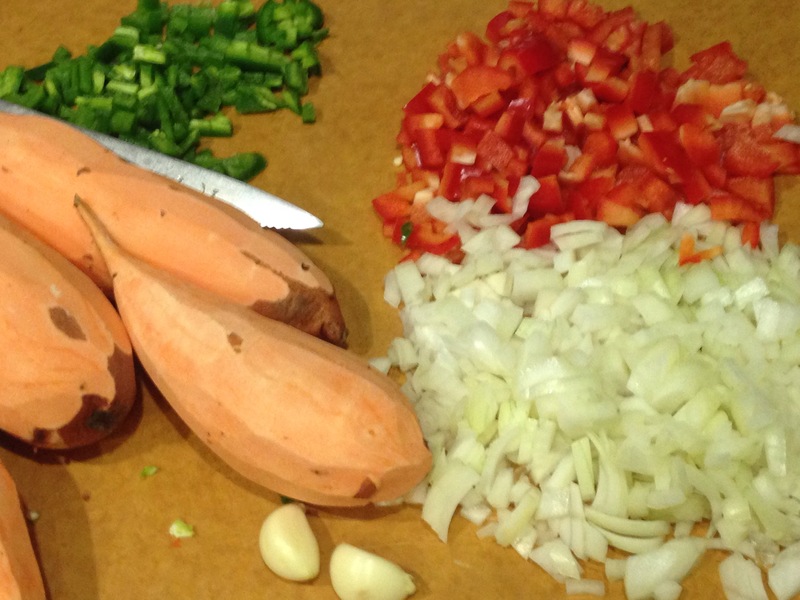 And there it was, in an old Whole Foods Market Cookbook given to me by a college roommate: a simple but intriguing recipe for a sweet potato chili with chicken But it was missing something: international flare. What could spice up a bland but sweeter chili? Aha! Moroccan spices – cinnamon, cumin, ginger, and coriander, to start. With a few of those individual spices absent from my spice cabinet, I added my own spice blend, searching to achieve the fragrant sweetness of a Moroccan tagine with the savory heat an American chili, even taking a hint of cocoa to add depth and richness (shh!) The recipe below will offer options if you have the necessary spices, as well for my tip of making the most of the spice blends you might already have in your cabinet. Here’s my secret: by combining a curry powder with pumpkin pie spices, you’ll manage to hit most of the more subtle spices in American, Middle Eastern, and Indian cooking. Just be careful on proportions and ALWAYS keep ground ginger and cinnamon on hand. My #3 spice blend (but #1 for garnishes, cold dips, etc.) is za’atar. In this case za’atar is more widely associated with Levantine (eastern Mediterranean) or Arabian cooking than North African, but it helps round out the sweetness of the chili for those that want a more savory dish. As hearty as chili can be, this one won’t weigh you down. It’s packed full of protein, nutrients, anti inflammatory capsaicin from the jalapeños, and dietary fiber. Dare I say it qualifies for the Healthy Diplomat stamp of approval? The recipe calls for a minimal amount of fat (oil), so I use small amounts of chicken stock to deglaze the pot and prevent sticking when sautéeing vegetables initially. To make this dish vegetarian/vegan, replace the chicken stock with vegetable stock, omit the chicken or replace it with texturized vegetable protein or a can of chickpeas/garbanzo beans. Adapted from The Whole Foods Market Cookbook, Copyright 2002 by Whole Foods Market Services, Inc.
*If you have individual spices available, try these: 1 tsp. Cinnamon; 1/2 tsp. Ginger, 1/2 tsp. Coriander, 1 tsp cumin, 1 tsp. Turmeric, 1/2 tsp. allspice. Proceed with the remaining (non-starred) spices in the list. In a large pot over medium heat, warm the oil and sauté garlic, onion, and bell pepper until just tender (onions will be translucent). Add the chicken and brown for about 4 minutes, tossing midway. Add in the spice blend, toss to coat and sauté for another 2 minutes. Remove from heat. 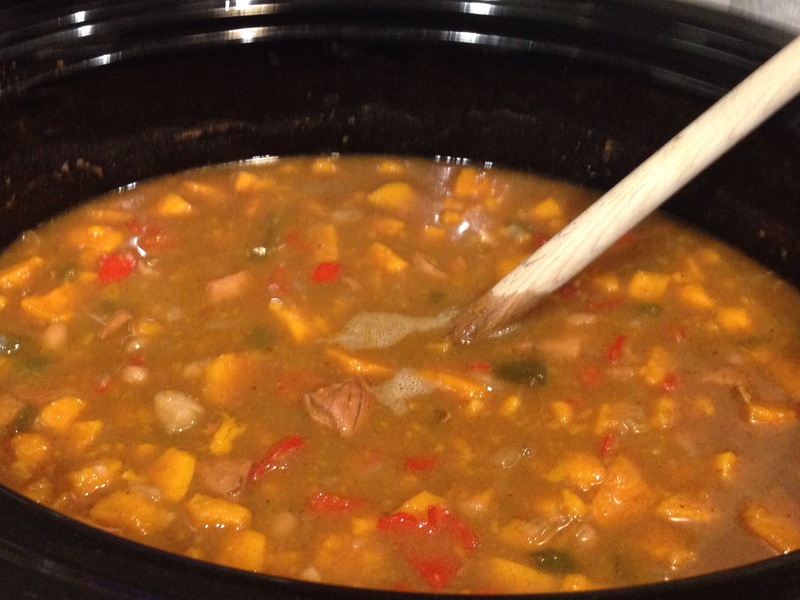 Slow cooker: If using a slow cooker (Crock Pot), place on “high” heat setting. Add in the chicken broth and water, followed by the jalapeño, sweet potatoes, and beans. Stir in the chicken and vegetable mixture until smooth. Leave on high setting for 3-6 hours, reducing heat to low as needed. chili after hours of slow cooking. If cooking via stove top, do not remove from heat; continuing on medium heat, add the jalapeños to the chicken and vegetable mixture. Sauté, slowly adding a small amount of chicken broth to cover the mixture and prevent sticking. Continue to add the remaining chicken broth; stir in the sweet potatoes, beans, and, finally, water. Bring to a boil. 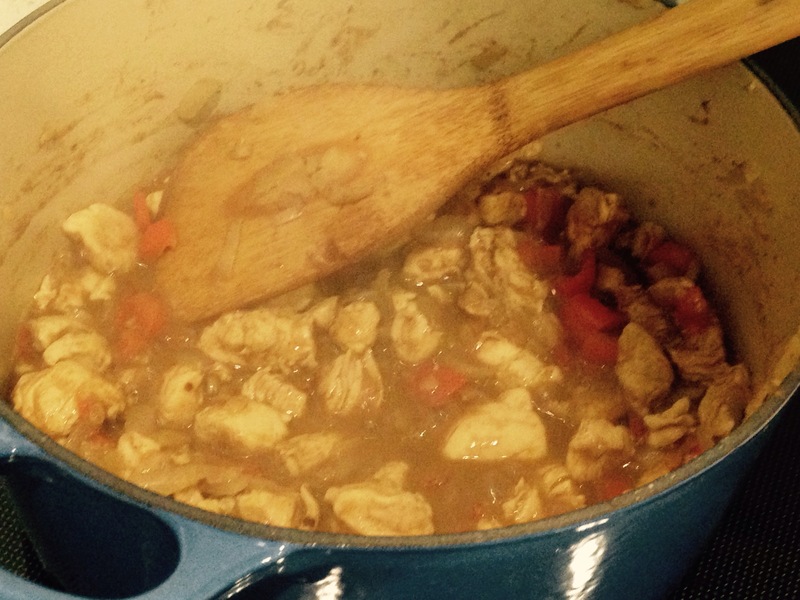 Reduce the heat to low and simmer for at least 30 minutes to one hour – more if desired. Serve with Greek yogurt, and if desired, za’atar. A fluffy but porous dinner roll will mimic traditional North African bread. I also like to serve it with plantain chips to serve as a New World counterpoint to the Old World spice in the chili.